So far this week, we’ve talked about nouns and verbs. 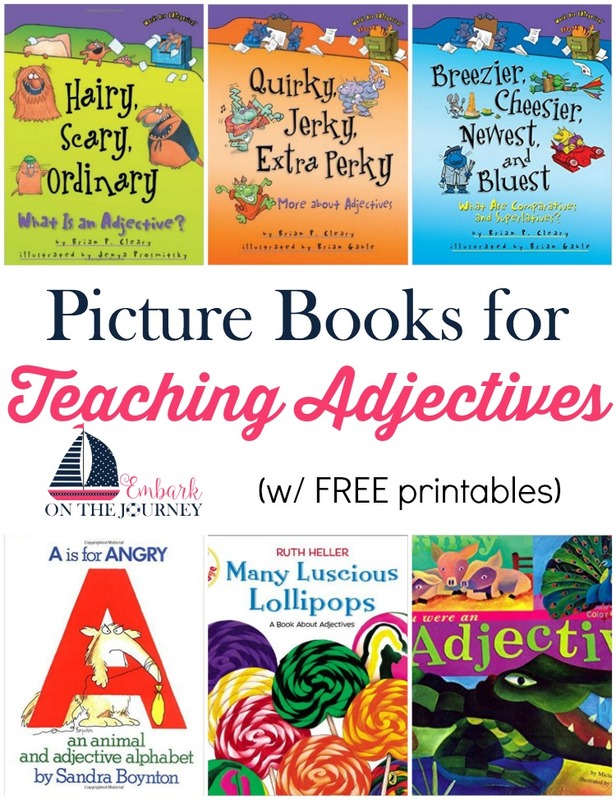 Continuing with my “teaching grammar with picture books” portion of this series, let’s talk about adjectives. Adjectives are describing words. They always describe or modify nouns. In order to be good writers, students need to be able to use adjectives to dress up their sentences. “Dogs bark” is a pretty boring sentence. “The little brown spotted dog barked” paints a much better picture. One fun way to teach about adjectives is to put a familiar object in a brown paper bag and ask your child to describe it. How does it feel? What shape is it? All of those words will be adjectives. As I have for the past two days, I’ll revert back to my favorite grammar picture books by Ruth Heller and Brian P. Cleary. Remember that Cleary’s books seem to be written for a younger audience. Hairy, Scary, Ordinary is a great book to use when introducing adjectives to your kiddos. Another great introductory book is Quirky, Jerky, Extra Perky . Once they’ve got the hang of things, you can introduce your kids to comparative and superlative adjectives with Breezier, Cheesier, Newest, and Bluest . Ruth Heller’s Many Luscious Lollipops is good for students who many already have some knowledge of adjectives already, because it’s more comprehensive than the other books mentioned. It covers all types of adjectives in one book – demonstratives, articles, possessives, and more. I’ve not read them, but I found A is for Angry: An Animal and Adjective Alphabet and If You Were an Adjective on Amazon. They both look good. A is for Angry is written by Sandra Boynton, and I’ve never read a book of hers that I didn’t like. 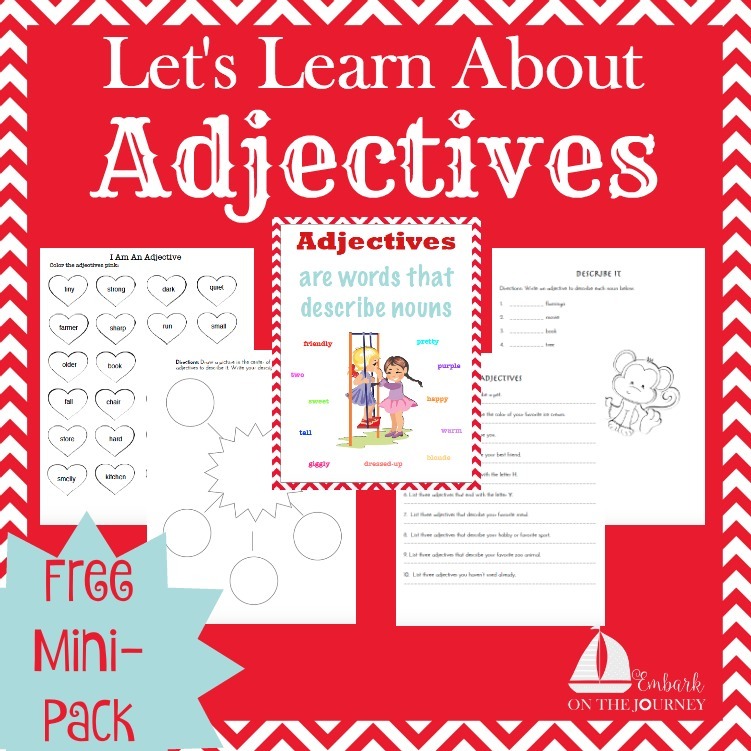 Inside this adjectives mini-pack, you will find an anchor chart and four worksheets. To download your free printable pack, you must sign up to receive my emails. Enter your contact information below. You should receive your download link within the hour. If, after an hour, you have not received your link, please contact me and we’ll figure it out together. What is your favorite resource for teaching adjectives to your kiddos? I just love these posts of yours about learning grammar through books! This has been our method and it’s been wonderful. Brain P. Cleary is awesome! We’ll be checking out some of the others too. We love using picture books to teach a myriad of subjects. Even though my oldest is in 6th grade we still love picture books.